GENEVA, Sept 3: With war trumping peace efforts in recent weeks in Syria, U.N.-mediated talks sputtered over another missed deadline to resume this past week. Analysts say patience is waning and prospects for a deal brokered by the United Nations are wearing increasingly thin. U.N. special envoy Staffan de Mistura, entering his 27th month in the job, on Thursday shrugged off his inability to meet two target dates in August to bring envoys from President Bashar Assad's government and the main opposition back to the table in Geneva. De Mistura blamed the increasing "militarization" of Syria's crisis for his failure and again deferred to Russia and the United States to lead the way out. "It's not about deadlines, about dates," he said. "It's about realities." De Mistura, a veteran Swedish-Italian diplomat, has long touted his "three-legged table" approach to helping end a merciless 5½-year war: Reducing the violence, boosting humanitarian aid and drawing Assad's state and its enemies into a political process. But Syria's largest city, Aleppo, is on the cusp of disaster, and a truce that gave beleaguered Syrians a respite early this year is all but dead. U.N.-led humanitarian aid is trickling in but only to the neediest spots. Turkish troops have crossed into Syria after years of staying out. 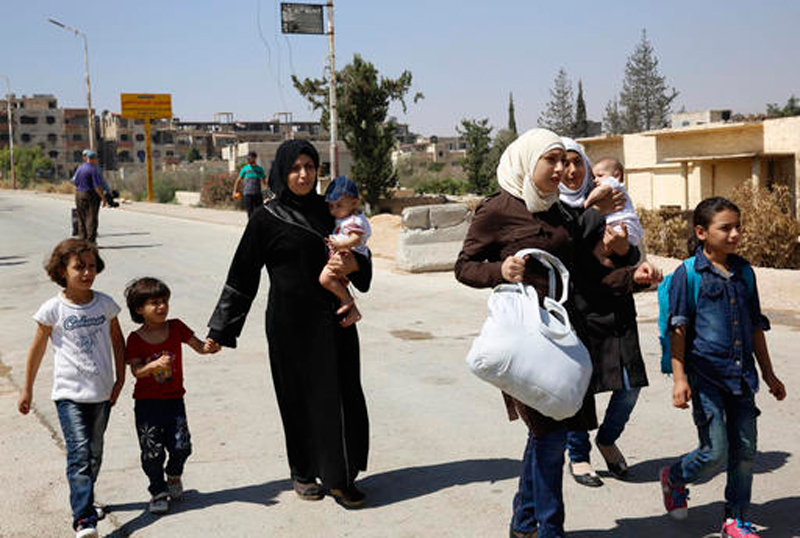 De Mistura says Assad now has "clearly a strategy" to force local surrenders and evacuations like recent ones by residents of two Damascus suburbs, Daraya and Moadamiyeh, after years of grueling sieges. De Mistura's Aug. 1 target date for resuming talks that broke up in April passed, then another went by at the end of August. No longer does he talk about timetables for getting the Syrian sides back to Geneva and is focusing instead on getting the world community more involved. He says he's preparing an unspecified "quite clear political initiative" to present before the U.N. General Assembly this month in New York, to help the assembly "look the Syria problem straight in the eye." In other words: Back to the international drawing board, just as two important political dates lie on the horizon: votes for U.S. president and U.N. secretary-general. On Aug. 26, de Mistura briefly dropped in on 12 hours of bilateral of talks in Geneva between U.S. Secretary of State John Kerry and Russian Foreign Minister Sergey Lavrov. In their final newsconference, they referred to de Mistura only once and Kerry canceled plans for a private meeting with him. Kerry did find time for dinner with Geneva's mayor, though. Critics have accused the U.N. of enabling Assad's government, either by bolstering it with humanitarian aid that goes to his supporters or naively thinking he and his backers will accept a political transition when the war has recently been going their way. U.N. officials say their job is to help all civilians in such war zones, whether in areas Assad controls or outside them. Analysts acknowledge de Mistura always faced a tough task. "No one will question Staffan de Mistura's well-intentioned efforts, but one can certainly question the strategy adopted," said Emile Hokayem of the International Institute for Strategic Studies. Some of de Mistura's questionable assumptions, Hokayem said, include believing that Russia and the U.S. could have sway with key regional players Turkey, Saudi Arabia and Iran, or that Moscow had the leverage or the will to steer Assad toward an accord. He noted how Russia has been both a participant, helping Assad's fight, as well as an arbiter in the war. "The U.N. is in an extremely difficult place right now ... It largely has relied on the U.S.-Russia track," said Hokayem from Beirut. "It is basically a hostage to battlefield developments, great-power politics and regional preferences." U.S. and Russian experts worked behind closed doors in Geneva this week on details of a joint plan, and some U.N. diplomats are hoping that Presidents Obama and Putin may provide some direction on Syria from a Group of 20 summit in China this weekend. Jeffrey Martini, a Middle East expert at the Rand Corp. think tank, says Moscow and Washington's main point of commonality is opposition to the Islamic State group, and until its extremists are quelled, a political process in Syria will be on hold. Fighting ISIL is the "low-hanging fruit, more than the civil war ... which is much more intractable," Martini said. Assad's allies Russia and Iran also appear to be hoping to rearrange the chessboard by improving ties between Syria and Turkey, long one of the strongest supporters of the anti-Assad rebels. Turkey's incursion into northern Syria in August to fight Kurdish militias and IS militants showed that Ankara and Damascus have common enemies. Last week, Turkish and Syrian intelligence officials met secretly in Baghdad, an Iraqi intelligence official told The Associated Press, speaking on condition of anonymity to discuss the meeting. Lebanese journalist Mohammed Ballout, who has close contacts with Damascus, wrote in the As-Safir newspaper Friday that Putin is trying to put together a meeting between Assad and Turkish President Recep Tayyip Erdogan. A Turkish official, speaking on condition he not be named in line with government regulations, denied any such efforts were underway. De Mistura on Thursday expressed "a strong feeling of outrage and disappointment" because of thenew violence and increasing struggles to get convoys of aid into priority U.N. areas. "The more we see that happening, the more determined we are in not letting the Syrian people down," he said. "So don't interpret, please, any of those events which are terrible and are sad as an indication that ... we are giving up on the Syrian people and on a solution." When de Mistura became the U.N. point man on Syria in July 2014, few expected him to work miracles where other seasoned diplomats — former U.N. Secretary-General Kofi Annan and former Algerian Foreign Minister Lakhdar Brahimi — had failed. This year began somewhat auspiciously. In late 2015, world and regional powers pushed Assad's government and the "moderate" opposition — excluding extremist groups like Islamic State and al-Qaida-linked Nusra Front — to agree to "indirect" talks in Geneva under de Mistura's mediation. The truce brokered by the U.S. and Russia largely held for weeks, and humanitarian aid that was all but nonexistent last year began flowing. But each seeming advance fell to pieces. Talks deadlocked over the issue of Assad's fate. Violence in Syria resumed. De Mistura suspended the talks in April. The last leg to weaken has been the humanitarian front. After a miserable 2015, the U.N.-led efforts brought aid — food, water, equipment, medicines — to dozens of "besieged" and "hard-to-reach" areas in the first half of this year. But aid convoys all but ended in late summer because of unrelenting fighting. De Mistura angrily noted in mid-August that convoys in preceding weeks had reached only one area, the Waer neighborhood of Homs — even as airdrops by the U.N. World Food Program continue to government-held areas of eastern Deir el-Zour. Hokayem said de Mistura should resign "as a 'big bang' and lay it all on the table." "If, on the mere issue of humanitarian access, nothing significant can happen, then it is time to ask the question: What is this process for?"